Many people don’t realize the importance of regular, consistent teeth cleaning. It is a major part of oral hygiene; teeth cleaning helps to remove dental plaque while also preventing such problems as cavities, gingivitis, and periodontal disease. If you do not take care of your teeth, you may lose them as you age. Therefore, it is important to maintain strong, healthy teeth, so that you can continue to eat the foods you enjoy and not have to feel forced to get replacement teeth (i.e., dentures, dental implants). What Happens During a Regular Cleaning at the Dentist’s Office? Dr. Naik, a highly experienced Inland Empire dentist, has a friendly personality and the knowledge necessary to help both children and adults feel comfortable during their visit with him and his staff for regular cleaning. Plaque and tarter (the plaque that has hardened at and/or below the gumline) will be removed with special dental tools at this time. A gum evaluation will be performed and a tooth polish may as well. The teeth cleaning process is usually painless; however, it depends on the condition of your oral health. Some individuals request a local anesthetic. How Often is a Visit to the Dentist Necessary? Seeing a dentist twice a year is usually just the right amount of time for most people. However, everyone is different; some may require fewer visits and others may need to schedule an appointment more frequently. 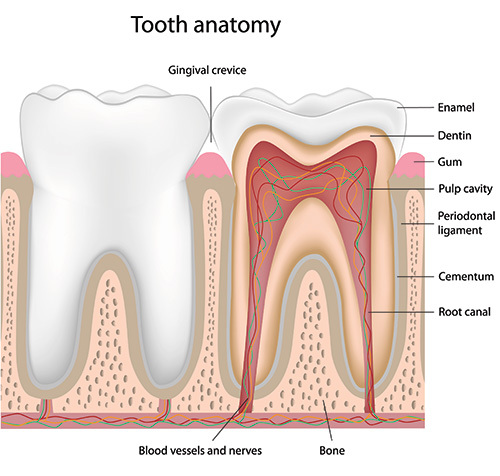 The type of people who are at a high risk of dental disease (which are those who may need to go in about every three to four months) include: smokers, diabetics, and those with gum disease, a weak immune response to bacterial infection, and often tooth decay (cavities) or a build-up of plaque. No matter your oral health problem, it is important to always follow Dr. Naik’s visit recommendations regarding your visits. What are the Best Teeth-Cleaning Habits to Have at Home? It is important to brush your teeth at least twice a day and floss daily (especially after you eat something that gets stuck in your teeth). Be sure to also pay attention to your tongue when it comes to oral hygiene. Some people use a tongue scraper to help remove plaque and freshen breath. Although, the bristles from your toothbrush can also be effective in doing the same thing. In addition to brushing your teeth and flossing, rinsing with a fluoride mouthwash is also important as it helps to strengthen tooth enamel. How does nutrition affect the quality of my teeth? If you are committed to maintaining good oral hygiene, then you should also pay proper attention to what you are eating. Try to avoid sugary and/or sticky foods because sugar feeds the bacteria in your mouth which, in turn will excrete substances that break down tooth enamel. Sodas and fruit juices are also full of acids and natural sugars, so be sure to substitute your craving for a sweet drink with plenty of water. What Puts Good Oral Health at Risk? In order to have good oral health, you must continue to practice good oral hygiene. Parents should teach the important habits of at-home cleaning to their children as well as make sure that they visit the dentist regularly. This will help to prevent such issues as periodontal disease and future tooth loss. Having a constant dry mouth can ultimately do harm to your overall oral health. A dry mouth means the mouth is not producing enough saliva, which leaves it as the perfect breeding ground for bacteria. In turn, many of these “microbes” could cause infection, which may lead to problems such as cavities and gingivitis. So be sure to stay hydrated – a dry mouth can also cause bad breath.